The Bakun dam under construction. Photo: pHotosHo0x via Flickr. What the government is doing when they're flooding all these areas is actually killing off the culture, the traditions of the community. It's basically ethnocide. Sarawak, Malaysia, is located on the island of Borneo, the third largest island in the world. Sarawak is home to thousands of endemic species, forty indigenous groups, and one of the largest transboundary rainforests remaining in the world. The state is also suffering from one of the world's highest rates of deforestation; only 5% of its primary forests remain. Now, Sarawak's forests and their inhabitants face another threat: the damming of its rivers for hydroelectric power. The Malaysian government and its state-owned energy utility Sarawak Energy Berhad (SEB)plan to build 12 large dams, due to produce 7,000 MW (megawatts) of electricity. Six of them are scheduled for completion by 2020. These dams are part of a development initiative known as SCORE (Sarawak Corridor of Renewable Energy), created to "stimulate global and domestic investment in traditionally rural areas." SCORE's long-term energy generation strategy includes harnessing a potential 20,000 MW of hydroelectric power. According to an analysis by International Rivers, the proposed mega-dams will flood 2,300 square kilometers of tropical rainforest. The 1,200 MW Baram dam, the next dam slated for construction in Sarawak, will flood an area of 412 square kilometers. The projected 12 dams will produce 7,000 MW of electricity in Sarawak, although local energy demand is now just 972 MW and is only projected to reach 1,500 megawatts by 2020. The 2,400 MW Bakun dam, commissioned in 2011, is being operated well below capacity. "In March 2012, the mining giant Rio Tinto cancelled its plans to build a $2 billion aluminum smelter that would have used electricity from the Bakun Dam not long after the Malaysian national government began a corruption investigation into the project." A recent Oxford study found that "even before accounting for negative impacts on human society and environment, the actual construction costs of large dams are too high to yield a positive return." The rainforests of Borneo are home to hundreds of indigenous plant and animal species found nowhere else in the world, including the endangered Bornean orangutan, the rhinoceros hornbill, the Bornean sun bear, the Bornean pygmy elephant, and the Bornean clouded leopard. These forests are a vital refuge for 221 species of terrestrial mammals, 420 species of resident birds, and 254 reptile species, among others. According to the World Wildlife Fund, "Between 1995 and 2010 over 600 species have been discovered - that is three species each and every month." If SCORE's dams are built, they will flood endangered wildlife habitat, disrupt migratory patterns of fish and birds, and fragment species populations, causing them to decline. This will not only be a loss to locals, but a loss to the whole world. To create these dams, tens of thousands of indigenous people from 20 different ethnic groups will be removed from their traditional lands and homes. Built by the Chinese company SinoHydro, the Bakun dam flooded 696 square kilometers of old forest ecosystems and displaced 10,000 indigenous people, mainly from the Kenyah and Kayan tribes, drowning their villages, farms and the forests in which they would hunt and gather foods, medicines and other goods. Yet those displaced were forced to pay nearly US$15,000 for government-built homes, throwing families into debt. Over a decade later, many families live in extreme poverty. Although indigenous community members have voiced opposition to the 1,200 MW Baram dam on multiple occasions, government officials posit that the people of Baram will benefit from its construction - although an estimated 20,000 people will be forced from their homes. In previous schemes, those relocated have not been provided the compensation and amenities they were promised. Families relocated during the Bakun dam construction were promised ten acres of farmland each, but received a fraction of this. Communities displaced by finished dams experience severe poverty and health problems caused by poor diet and water pollution. Despite being relocated to provide energy for the state, resettled families pay unsubsidized water and electricity bills in their government homes. Bakun dam refugees are now unable to hunt and gather in the forest, but are forced to make due with small plots of land. Mark Bujang, the head of Sarawak NGO Borneo Resources Institute, commented, "What the government is doing when they're flooding all these areas is actually killing off the culture, the traditions of the community. It's basically ethnocide." In the past 30 years, many of Sarawak's forest-dependent people have had their traditional lands taken and sold, often without their knowledge. This is possible because the Sarawak government does not fully recognize indigenous peoples' Native Customary Rights (NCR) claims to their land. Not only are claims ignored, but the health of indigenous communities is an afterthought. For example, the SEB did not begin the 944 MW Murum dam's social and environmental impact assessment until the construction was already under way. Without proper representation in Sarawak's government, tribal leaders have resorted to protest. Threatened indigenous communities erected blockades in an attempt to prevent the Murum and Baram dams from reaching completion. Participants in these blockades have been isolated, intimidated, threatened, and arrested. 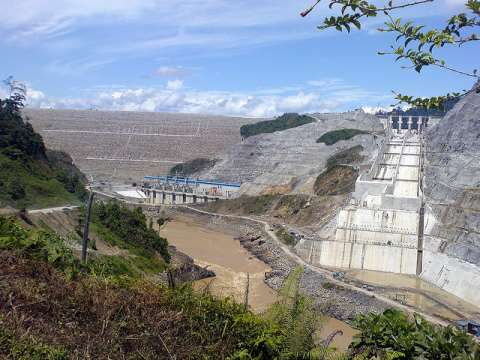 And even though the Bakun dam is still unable to sell all its electricity, construction of the Murum dam was completed in 2013 by China Three Gorges Corporation and Sinohydro, and its reservoir is being filled. "We the people of Baram ... would like to reiterate urging to the government and the Sarawak Energy Berhad (SEB) to stop and revoke its plan to build the Baram Dam. "We also demand that all activities that are carried out in connection with the proposed Baram Dam be ceased forthwith as we regard the proposed dam as a real threat to our rights, lives, livelihood, lands, resources, properties, heritage, and future and urge all parties to respect our rights and choice to remain in our respective existing villages and settlements." While mega-dams are often touted as a source of 'green energy', they actually contribute to climate change. The foul stench of sulfur emitted by the Bakun dam reservoir in Sarawak can be smelled kilometers away, and local people report that the water now causes diarrhea. According to Zach Hurwitz of International Rivers, "The carbon budget of these massive reservoirs is likely to produce as much CO2 equivalent in methane as a typical fossil fuel power plant over a ten year span." Peter Kallang of SAVE Rivers said, "You cannot say this is a Sarawak problem - this is our national problem. If you look at the impact of a dam on the environment, this is an international problem, because it will drown one of the most biodiverse parts of the world." The massive dams that will submerge Sarawak's forests present one of the greatest environmental and social threats the island of Borneo has ever faced. SCORE's dams will critically compromise the existence of thousands of discovered and undiscovered plant and animal species. Two thousand square kilometers of vital rainforest and the homes of tens of thousands of indigenous people will be flooded, all for an unsustainable, unprofitable, and unnecessary energy source. Amanda Stephenson is a writer, researcher, and filmmaker living in Oakland, CA. She is working with the Borneo Project on an educational film series documenting the environmental and social catastrophe that would follow the construction of Malaysia's proposed mega-dams. If no action is taken, thousands of people will be forcefully relocated and countless species will be threatened.